Could No Sick Leave Cause Poor Health? It’s about that time of year. Cold and flu season is greatly approaching. Although some employees may have paid sick leave, they may be afraid to use it for risk of ruining their reputation. On the other hand, maybe there is no one to cover their shift. Employees do not have a choice in workplaces where there is no paid sick leave. If these employees stayed home, they would risk losing pay, or in some cases, their job. 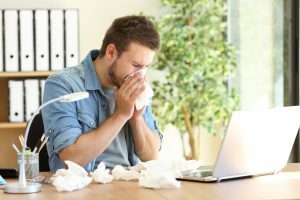 A recent study has shown that workplaces without paid sick leave are at risk for harming the health of their employees. A 2013 report by the National Partnership for Women and Families looked at the effect of paid sick leave on health outcomes. They found that four of ten private sector workers and eight of ten low-income workers do not have access to paid sick leave. Also, these workers were 1.5 times more likely to go to work with the flu or a viral infection. In the fall of 2009, nearly eight million workers went to work with H1N1. In turn, these people are thought to have infected seven million of their co-workers. This string of events was likely the cause of the peak of the pandemic. Furthermore, parents who do not have paid sick leave are more likely to send their sick kids to school or daycare. This is because the parents have no other form of childcare and cannot afford to stay home unpaid. This situation puts care givers, teachers, and classmates of the child at risk. Therefore, paid sick leave is important for the health of not only the worker, but many others as well. A study of nearly 18000 workers between the ages of 18 and 64 years of age looked at the effects of paid sick leave on overall health. Those without paid sick leave were more likely to have mental distress than those who did. In fact, those without sick leave had nearly 150-percent more mental distress. This distress can disrupt the daily life and activities of those with no paid leave. Young, Hispanic, low-income, and poorly educated groups were at greatest risk. These results suggest that lack of paid sick leave is a social justice and health disparity issue. Access to paid sick leave may not be under your control. However, you can take steps to prevent sickness. Eat a balanced diet with plenty of immune-friendly fruits and vegetables. Stay active each day since exercising can boost heart health, keep weight at a healthy level, and in turn protect overall health. Practice good hygiene by washing your hands regularly, especially if you have contact with others in your daily life. Caregivers, healthcare workers, and teachers are just some examples of workers who may be at most risk for exposure to germs. Therefore, these workers will need to be even more diligent about washing hands often and perhaps keeping sanitizer close at hand. Take immune-friendly supplements such as Biovia30 by Vita Sciences. Biovia30 is full of 30 million colony-producing units of probiotic strains to promote health digestive and immune health.